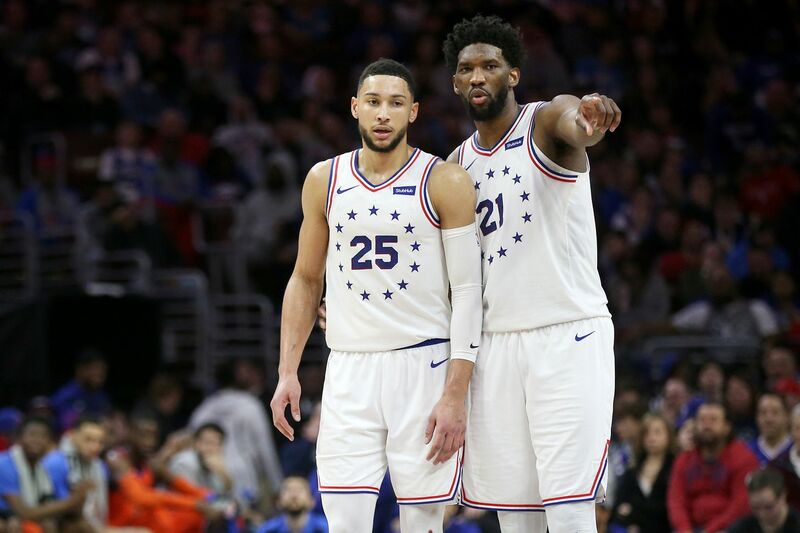 The Sixers' Ben Simmons (25) talks with teammate Joel Embiid (21) during a game against the Oklahoma City Thunder at the Wells Fargo Center in South Philadelphia on Saturday, Jan. 19, 2019. The Sixers lost 117-115. You want to feel some warm fuzzies? Find the video of the Sixers’ win over the Cavaliers last week and fast forward to the 8:20 mark of the fourth quarter. Ben Simmons is pushing the ball up the left side of the court on a 4-on-3 break. Joel Embiid is trailing near half court, his eyes zeroing in on an open lane up the middle. Just as Simmons attacks the paint, his counterpart arrives, charging down the open chasm in front of the weak-side help. Simmons flicks a baby lob up toward the rim, and Embiid goes up and gets it, contorting his body to bank home a layup just before his momentum sends him tumbling over the baseline. It’s the kind of athletic display that will be the subject of our stories decades from now, 14 feet and 500-plus pounds of lean muscle speeding toward the same point like an eighth-grade word problem. But don’t hit pause yet. Wait a couple of seconds, after Embiid pushes himself up off the court, after Simmons scurries toward him, after both of them leap toward each other in jubilation. Now, freeze it, and drink in the sight: two shoulders separated by only a layer of sweat, four sinewy legs suspended above the the ground, four white numbers flush with each other against an unbroken background of red. An innocuous moment? Perhaps. But if you’ve spent some time around the Sixers lately, and you’ve kept your eyes open and your ears unplugged, you can’t help but conclude that it was evidence of something bigger. This has been an easy season to lose sight of the original blueprint. First, Jimmy Butler arrived. Then came Tobias Harris. In this era of Super Teams, you are never going to completely shake the feeling that what you have isn’t enough. Yet the trajectory of this current era is going to rise and fall on those two sets of shoulders that connected under the basket against the Cavs. That’s worth remembering as the Sixers prepare to take on the Celtics on Wednesday night in a battle that will have huge implications for the Eastern Conference playoff picture. While it has been billed as a measuring stick for this Sixers team, it is, first and foremost, an opportunity for Simmons and Embiid. The Sixers' Joel Embiid (21) talks with teammate Ben Simmons (25) during a game against the Oklahoma City Thunder at the Wells Fargo Center in South Philadelphia on Saturday, Jan. 19, 2019. The Sixers lost 117-115. No doubt, there are other variables. The Celtics will likely be without Gordon Hayward, whose 6-for-7 shooting performance from three-point range played a decisive role in Boston’s 112-109 win on at the Wells Fargo Center on Feb. 12. Their rotation will include Aron Baynes, who is 9-for-21 from three-point range in his career against the Sixers, and 12-for-61 against everybody else (Baynes, who was a big factor in last May’s playoff loss, hasn’t faced them since the season opener). The Sixers will need more than the 0-for-6 showing they got from Tobias Harris from downtown the last time around (he’s been mired in a bit of a funk, shooting .324 from deep over his last eight games after shooting .423 in his first 63 games of the season). But while the Celtics’ bench has been a big reason why they’ve won 10 of 12 games over the Sixers since the start of last season, the Sixers two young superstars are going to need to be the reason they are able to overcome Boston’s depth. Since the start of last season, Embiid is shooting just .434 against the Celtics, compared with .482 overall. Of his 214 attempts, 49 have come from three-point range, with just 11 makes among them. Simmons, likewise, is shooting .496 against the Celtics, compared with .554 overall. There is nothing secret about Boston’s approach. Pack the paint, and make ‘em earn it. This season, the Sixers are averaging 47.1 field goal attempts per game inside 14 feet. Against the Celtics, they are averaging just 41. There’s an argument to be made that everything starts on the defensive end of the court. But in three games against the Celtics this year, the Sixers’ 109 defensive rating is the same as what it is overall. On the offensive end of the court, their 100 rating is 12 points lower. The reality is, there is only so much defense you can expect to play against a team so uniquely situated to exploit the Sixers’ vulnerabilities on the perimeter. Kyrie Irving is going to get his buckets. Jayson Tatum is going to get his too. For the Sixers to finally get over the hump against the Celtics, Simmons and Embiid are going to have to get theirs. With every game, both players seem to improve in that regard. The story of the past couple of weeks has been the way they’ve improved in tandem. And it’s the biggest reason to think Wednesday night’s matchup with Boston might be different from all the ones we have seen thus far.